Birds that poop money! 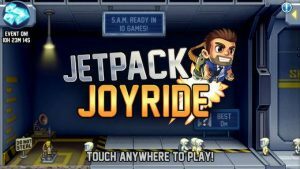 Suit up with a selection of the coolest jetpacks ever made and test your skills as legendary action hero Barry Steakfries. Over 500 million players can’t be wrong. Download FREE and start your adventure today! I love this game and am really good at it. I wish that i can play multiplayer against my brother. Maybe you can add a update so we can play the same game and compete for coins and power ups. What i mean is that He can steal coins that are in front of me if he gets a boost or vehicle and I don’t. But then later I get a vehicle or something and steal his coins or gems. Please add this in the game. It would make it a whole new experience. I really love this game, but when the wifi is on and I get a spin token, it crashes. What happens is an ad comes up and when it’s over, it freezes. I close out the app completely and go back in. It fixes it but it’s kind of annoying. Other than that, I love the game. Please fix it and then I’ll give you five stars.